The Korean LG has unleashed a new rather interesting device that is more than a smartphone but less than a phablet. 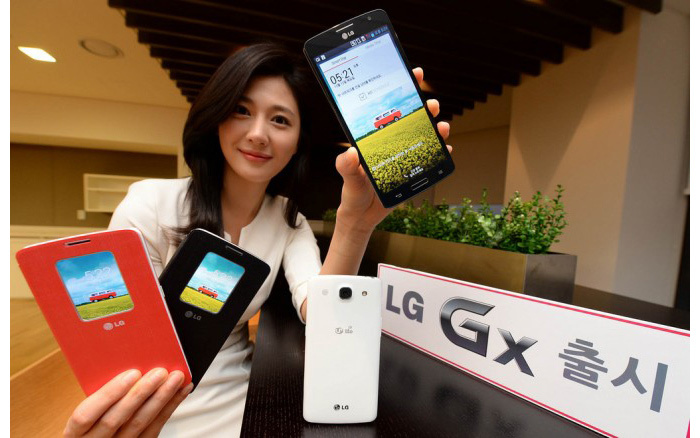 The new LG GX is based on Android and measures 150.6 x 76.1 x 9.2 mm for total weight of 167 grams. The device comes with a large 5.5-inch sensor IPS display that works at Full HD resolution (1920 x 1080 pixels). Inside the LG GX boasts a powerful Snapdragon 600 quad-core processor at 1.7 GHz and Adreno 320 graphics. The smartphone also has 2 GB of RAM, 32 GB of internal memory, a microSD card slot (up to 32 GB), a rear 13 MP BSI camera, a front 2.1 MP camera, an infrared port, a GPS receiver, NFC, Wi-Fi and Bluetooth 4.0. There’s also LTE support. But the LG GX does not stop here. This rather innovative device sports a number of advanced technologies that includes support for Smart TVs by LG, a new version of LG’s UX user interface, QRemote that allows using the smartphone as a universal remote control around your home as well as KnockOn technology that allows you to wake up your smartphone just by touching it twice on the display, SmartDay for extra information on the display and more. The new LG smartphone runs Android 4.2 Jelly Bean. Unfortunately the pricing of the device is still unknown.